FAYETTEVILLE, Ark. – Behind a complete-game shutout by freshman Mary Haff, the No. 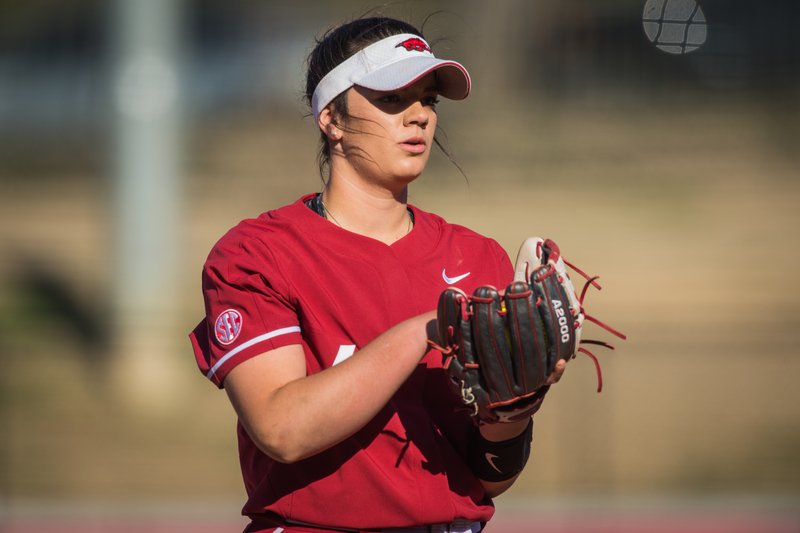 19 University of Arkansas softball team posted a 3-0 win over No. 15 Alabama Saturday afternoon at Bogle Park. The victory is the program’s first against the Crimson Tide since the 2012 season. With the win, the Razorbacks improve to 32-9 overall with a 7-7 mark in SEC games, equaling their conference total from a year ago. The series finale between Arkansas and Alabama is scheduled for Sunday at 1 p.m. (CT). The first 100 fans in attendance will receive a free pink t-shirt in recognition of breast cancer awareness. Gates at Bogle Park open at 12 p.m.
Haff registered nine strikeouts—her high in SEC play—and allowed just four hits with no walks against Alabama. The outing marks her eighth complete-game shutout of the season and her second against an SEC opponent. With her sixth strikeout of the game, Haff moved into the program’s single-season top 10. She currently sits at 181 strikeouts in 136.2 innings during her freshman campaign. After a scoreless first inning, the Razorbacks broke through in the second with two runs without the benefit of a hit. Senior Tori Cooper and freshman Kayla Green drew back-to-back walks to lead off the frame and both moved into scoring position on a wild pitch by Alabama starter Courtney Gettins. Junior Ashley Diaz drove in the first run with a sacrifice fly to right field and senior A.J. Belans added another with an RBI ground out to second. Haff gave up an infield single on the first pitch of the game but proceeded to retire the next nine hitters she faced. After the Razorbacks took a 3-0 lead in the third on an RBI double by Katie Warrick, the visitors put together a threat in the top of the fourth with two on and one out. However, Haff responded with a strikeout and a fly out to left to get out of the jam. Down to its last set of outs, Alabama (26-12, 7-7 SEC) had runners on first and second with two outs after a pair of singles to right field. Once again, Haff came through and got a pop up handed by Belans just inside the foul line to end the game. Saturday’s game marked just the second time Arkansas had shut out Alabama in the series history, and first since 2002.